Want that #FridayFeeling? My secret is MatchaBiotics! Do you want that "Friday Feeling"? Here's a secret: I get help from MatchaBiotics! I've mentioned in the past that I swear by Probiotics. I take them daily. Now, by all means I am not a medical professional, but I have read so many articles about the importance of a "healthy gut". As a consumer, I do my research before buying an supplement. I try to find quality products that make me feel good! Scroll down to read more about this daily capsule that combines Probiotics and Matcha green tea! 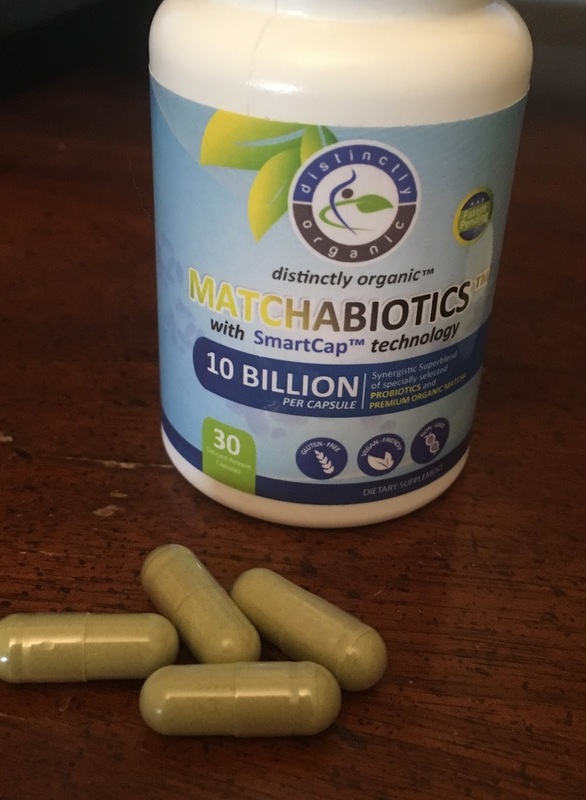 Unless you’ve been living in a cave somewhere, if you’re into healthy lifestyle, you will have definitely heard of Probiotics and Matcha green tea - but have you heard of MatchaBiotics? If you are one of the 70% of Americans who suffer from stress; the 74% living with digestive symptoms like constipation, diarrhea, gas, bloating or abdominal pain; or the 45% who go around feeling tired or fatigued, or the 53% still trying to lose weight; you may also be contributing to the tens of billions of dollars spent on remedies for these conditions each year - remedies which, as a general rule, merely suppress symptoms rather than handle their actual cause. MatchaBiotics was formulated to address the above conditions in an entirely natural way. emotional state in ways we could never have dreamed of. This gives a whole new meaning to the term ‘gut feeling’. In double-blind, placebo-controlled, randomised parallel group testing, British scientists reported non-placebo participants paying less attention to negative information and more attention to positive information while French researchers noted, “Beneficial psychological effects in healthy human volunteers”. But MatchaBiotics is not just about probiotics and prebiotics. The capsules contain, amongst other things, organically sourced, naturally-occurring L-Theanine which promotes the production of dopamine, serotonin and alpha brain waves. These induce relaxation whilst enhancing mood, improving memory and promoting better concentration. Factor-in the probiotic/prebiotic feel-good component and things begin to look decidedly ‘chilled’ which might wellbe of interest to the three-quarters of Americans currently suffering from stress. The broad-spectrum blend of friendly bacteria within each MatchaBiotics capsule also busy themselves recolonizing your intestines, strengthening your immune system and promoting healthy digestion in much the same way as any ordinary high-end probiotic supplement does. While all green tea products naturally contain caffeine, the energy boost received from MatchaBiotics is largely due to its unique combination of other nutrients. That increased endurance can last up to 6 hours and because of the effects of L-Theanine, users experience none of the usual side-effects of stimulants such as nervousness and hypertension. It’s good, clean energy. The synergy between the Organic Matcha and the Probiotic Blend promotes weight-loss. Recent randomized controlled trials have confirmed probiotics’ impact upon the body’s weight and fat; whilst a study in the American Journal of Clinical Nutrition showed dramatic decreases in body fat mass and total fat areas for participants thanks to Matcha Green Tea. Then there are the antioxidants. If you know anything about antioxidants (and you really should) you will know that not all antioxidants are created equal. MatchaBiotics contains the super-antioxidant know as (deep breath) epigallocatechin gallate which specializes in neutralizing the harmful molecules known as free-radicals (free-radicals are associated with human disease, including cancer, atherosclerosis, Alzheimer's, Parkinson's disease and many others). Another fascinating aspect of the matcha green tea element is that clinical tests suggest it can help speed recovery in athletes whose focus is high-intensity workouts. Also found in MatchaBiotics are high levels of organic chlorophyll which bind with toxic metals to hamper absorption. Research has also shown that it can do the same with some carcinogens. There is much discussion in healthy-living circles, regarding how much of the live flora in supplements actually survives the acid bath that is the human stomach to reach the intestines where it must do its essential work. MatchaBiotics have solved this particular conundrum with their patented SmartCap technology. This entirely new, Vegan capsule steadfastly resists stomach acid but dissolves readily in the neutral environment of your small intestine. The SmartCap capsule delivery system used for MatchaBioticsis derived from vegetable cellulose and is 100% natural. SmartCaps contain no preservatives, gelatin, wheat, gluten, animal by-products or starch and are Kosher and Halal certified and allergen-free. MatchaBiotics is produced and sold by Distinctly Organic, a division of California Bioscience Inc.